It's another new month which means another month to accomplish some new goals. I didn't do as well as I wanted in October and only managed to check off half of my goals but I would still consider that an accomplishment. My stationery obsession got the better of me in October so I spent a lot of money on stationery supplies. I would love to try this again in November but that's when I start Christmas shopping so can't really. I did really well with this goal in October because of Blogtober. I gained a lot of new followers thanks to posting more frequently so I will continue to post as often as I can. I want to finish at least one more crochet piece before I open my shop. As soon as I finish it I will take pictures and post. 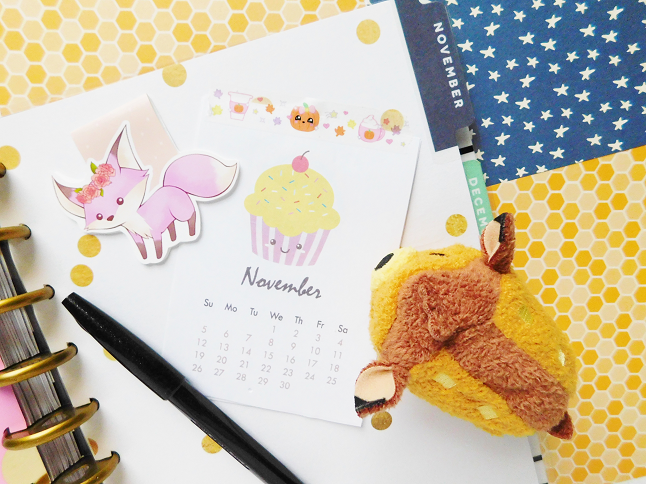 Pretty much every blogger who is doing Blogmas this year has been planning since September so I need to catch up! This is my 3 or 4 time participating in Blogmas and knowing me I will wait until last minute and stress myself out! That's why I am making it my goal to at least have 2 weeks of Blogmas scheduled and ready to go. Ideally, I would love to have the whole month scheduled but I doubt I will be able to that. The reason why I purchased a Traveler's Notebook was to start studying Korean again. I've been on and off with Studying Korean ever since I graduated Highschool in 2011 since I didn't go to college it was a way for me to keep learning but over the years I've put on the backburner. My overall goal is to one day be able to listen to Korean music without looking up the lyrics and watch dramas without using subtitles but I know that will take forever! Baby steps first, start with 1-2 hours of self-study Korean lessons. I'm going to attempt this goal again because this is something I really want to get done. I've had to this blog for many years but I don't think I've ever taken blogging completely serious. I mean I've continued to blog because it's a fun way to express myself and I love meeting other bloggers who share similar passions as me. But I never sat down and learned about SEO, affiliates, how to make money from blogging, etc. I don't understand these things so I want to learn as much as I can this month because I have tons of goals for this blog but I know only I can take it there if I work hard enough. A couple years ago I was prescribed a medicine to help reduce heart palpitations that I would get due to stress and anxiety. Earlier this year I got a refill of the same medicine but just the other day I read the side effects from this medicine that I've been taking (I know I should've read this a long time ago) and everything just clicked! I've been feeling really depressed recently (I mean more than usual, lol) but I'm pretty sure it's due to this medicine. I've always been pro-medication because if something is supposed to help you why not take it right? Well, now I'm not so sure. Now I understand why some people refuse to use medicine because of those damn side effects. I completely agree with you about medication, sometimes the side effects are absolute craziness. I hope you find another way to deal with your anxiety. I love the idea of this style of blog post, it's what I often have in my head but something about typing it out might help me actually do SOME of it. Lovely blog - I came across your blog after reading a post written by WhatLaurenDidToday. Wow I had no idea you had been blogging for so long! It's great to see that you're still able to come up with new things to post even after all this time.